Jason Tsang's Blog: What version of Media Center do you have? Due to the way Media Center is implemented (i.e. 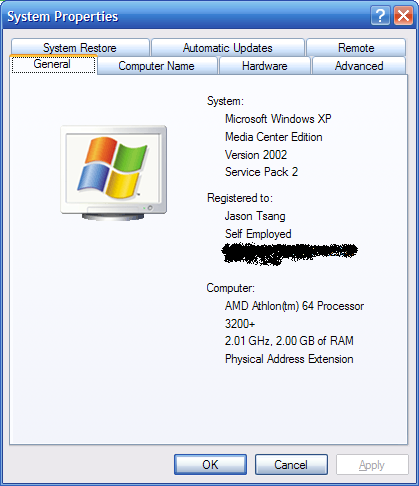 it's underlying operating system is Windows XP Professional, with additional Media Center specific items), there is sometimes confusion as to what version of Media Center is installed on your computer. For example, here are some places that may display to a misleading Media Center version. On the Settings menu, click General. 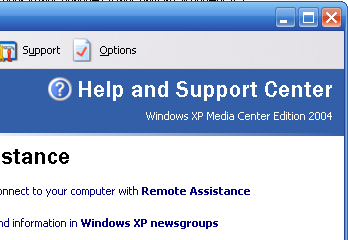 For Media Center 2005, you will have to also further click Software Version. The first three lines will be important to most people. The first line will identify the version of Media Center that you have (either no number which means you have 2002, 2004 or 2005) and the third line will identify the Update Rollup version that is installed. The second line is the specific version number of the ehshell.exe in the \Windows\ehome directory. This can be important in determining which updates you have installed. Mark Salloway, a fellow Media Center MVP, has compiled a listing of versions and corresponding build information for each version. Media Center also uses the 'Ident' value to identify the version of Media Center that is installed. Microsoft has recommended that programs check this value to ensure that the version of Media Center that is installed is appropriate for the needs of their program (it is easier than updating a list of version numbers after each update is released). However, there are times that the number could be changed mistakenly, leading to undesired results . This often comes up when during Update Rollup 2 for Media Center 2005 installation, or Xbox 360 Extender software installation. I'll discuss this further in a later blog posting. 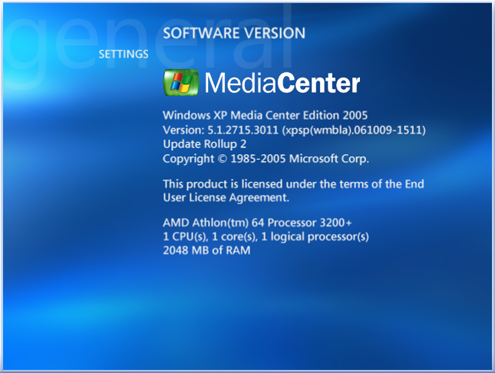 Hi, well, this media center program says i have media center edition 2005, but i dont have any update rollup, how can i install them?